Never before has the case for faux fur looked so good! By now you've probably seen street style stars and celebs are obsessed with British faux fur brand Shrimps and it's easy to see why. The fun (and warm!) outerwear options are all about bright colors and making a fun statement even when the mercury drops below 0º. Personally, I'm a fan of the cotton candy pink coat with navy stripes—shocker, I know—but all the fun colors look great and really add that wow factor to what could be an otherwise simple outfit. The best part is that with the success of Shrimps, hopefully other brands will turn to faux over real fur. I didn't even know Shrimps used faux fur until I read their 'About' page, that's how realistic their coats look! I just hope PETA got the message, because nobody wants red paint splattered over these gorgeous coats. 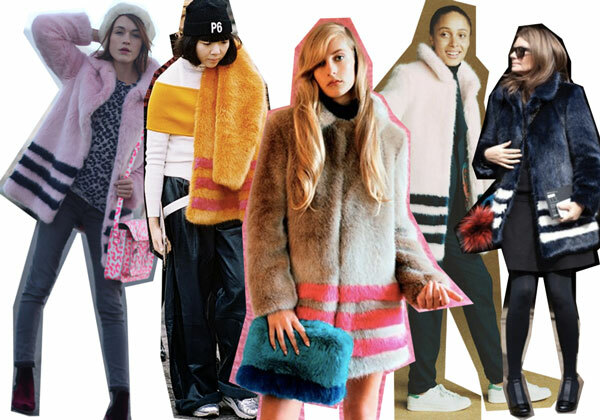 In addition to outerwear, Shrimps also has faux fur scarves, jackets, and even clutches, so check them out! I adore Shrimps and would love one of their gorgeous creations!